Peacefully with her son at her side on Saturday, January 26, 2019 Bina passed away at East Gate Lodge, Beausejour, at the age of 98. 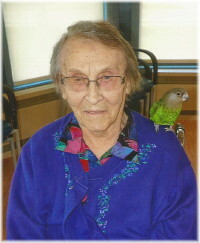 Bina was born in Thalberg, MB and spent her entire life on her farm in Brokenhead. She was predeceased by her husband John in 1984 and daughter Eleanor. She is survived by her son Larry and son in-law Orville, as well as numerous cousins. The family would like to thank the staff of East Gate Lodge for the care and compassion shown to Bina. A graveside service will be held on Saturday, February 2 at 1:00 p.m. at St. Mary Roman Catholic Cemetery in Beausejour. Viewing will be held at Sobering Funeral Chapel, 1035 Park Avenue E., Beausejour half hour prior to the graveside service. A lunch will follow the graveside service also at Sobering Funeral Chapel. In lieu of flowers, a donation may be made to a charity of one’s choice.